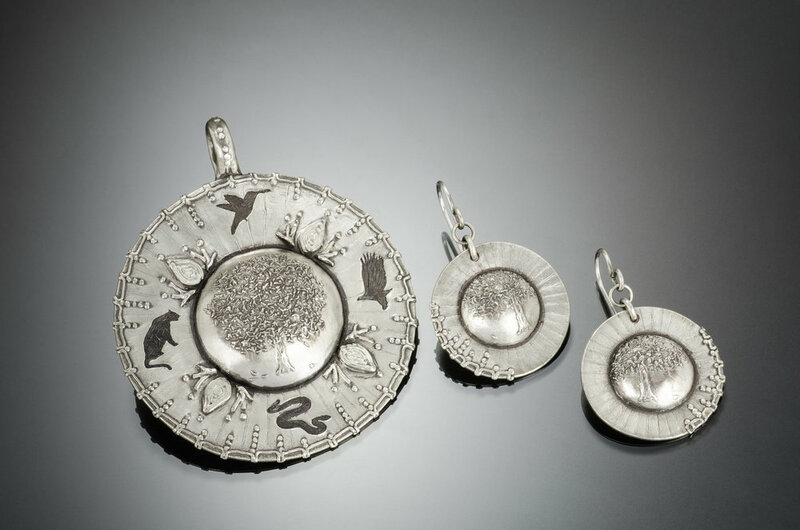 Kris designs and creates fine- and sterling- silver jewelry that features landscapes, wildlife, and tracks. Her medium is metal clay, in particular silver metal clay, which consists of silver molecules, an organic binder, and water. A kiln firing process removes the binder and water leaving pure silver or 96.2% silver. It is important to Kris that the metal clay contains 20 to 40% silver reclaimed from discarded electronics, photographic film, and other industrial waste. Kris’ sculpting is small and often only tools, not fingers, can best influence the clay. She loves silver down to the molecular level, believing it shares qualities with humans: it prefers change be incremental; it reflects light; it is fragile and strong at once. With silversmithing tools and techniques Kris finishes each piece to a virgin shine and/or an elegant satin, always with a dark patina inlay. Kris is a Precious Metal Clay (PMC) Senior Instructor certified by PMC Connection and Rio-Rewards Certified by RioGrande, thanks in part to a grant from the Montana Art Council, an agency of State Government. In 2012 Kris “passed with distinction the certification review” by the Montana Arts Council, signaling that she developed a sustainable business in art. The additional honor of distinction was awarded based on a demonstrated depth of understanding of her art and the development of a strong brand suited for her specific artistic and business niche.